It’s been over fifty years since The New Christy Minstrels made their splashy debut on the US music scene in the summer of 1962. Nine, sometimes ten voices strong, “the Christies,” as their fans called them, offered a robust, new vocal sound, accented with step out solos by the colorful personalities within the ranks. It was a fresh, engaging approach to pop-folk music that attracted widespread attention right from the beginning. Folk music attracted many powerful performers back then and the early line up behind the Christy name was a hand-picked assemblage of some of the best. 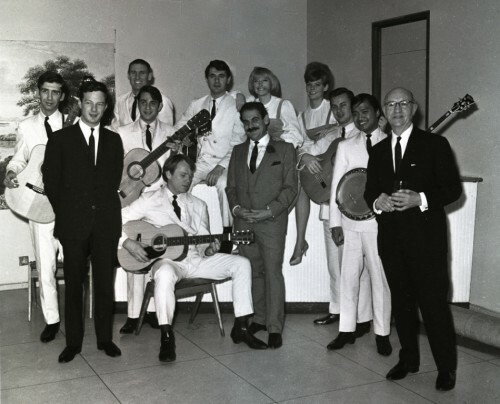 The New Christy Minstrels were the brainchild of Randy Sparks, an entrepreneurial singer/songwriter who had a successful career in his own right in the late Fifties and early Sixties. He explains his inspiration for the group thusly, “A big fan of choral groups, I was critical of their invasion of the folk field. No one, I thought, had yet applied the big, earthy, sometimes rough-hewn sound of the untrained folksinger to the choral group advantage of number. More specifically, when a choral group sings ‘On Top of Old Smoky,’ it sounds not unlike a religious anthem; but when a folksinger chews away at it, I get the intimate feeling the song’s many generations of accumulated authors must have intended. So, I purposefully sat down to design a group that would be a compromise between The Norman Luboff Choir and The Kingston Trio.” Randy named the group after Edwin Pearce Christy’s Minstrel troupe of the 1800’s, who introduced many Stephen Foster songs. In a similar way, he hoped the group’s innovative sound would become an effective showcase for his own efforts as a songwriter. From the outset, the group was launched with entertainment – not editorial – being the goal. Randy had seen politics sideline the career of the Weavers in the mid-Fifties and he wanted no such baggage. His vision was to appeal to a broad audience with upbeat material and catchy lyrics. The idea was novel — and commercial — enough to land a contract with Columbia Records and a recurring spot on The Andy Williams Show on NBC before the group roster was even finalized. The group’s appearances on the Williams show — national exposure week after week — attracted a national audience of enthusiastic fans within a couple of months. At this point in their career, the New Christy Minstrels were considered cutting edge – a dynamite act that brought a robust new sound to both pop and folk music genres. In late December, the group appeared at Carnegie Hall in New York CIty — less than six months after their first public performance. It was an amazing feat, and the group earned both commercial and critical stature within the music business. Their debut album, “Presenting the New Christy Minstrels,” won the Grammy for “Best Recorded Performance by a Chorus in 1962.” In 1963, they released three more albums that all made it into the upper rungs of the charts, one of which — Ramblin’ — went gold and spawned their biggest hit single, “Green, Green,” featuring a strong solo by gravel-voiced front man, Barry McGuire. By the end of the Andy Williams season, the group was much in demand across the country. They opted not to return to the Williams show for a second season and, instead, hit the more lucrative concert trail. With a strong roster of colorful performers, the group was a dynamite stage act and the concerts were big draws. However, the pace of the touring schedule was grueling and, as a result, turnover became an ongoing challenge, especially in the years that followed when the bloom of their initial success started to fade. Few would debate that 1964 was one of the most dramatic years in popular music. When the Beatles hit the charts with “I Want to Hold Your Hand,” pop music was never the same. That would have been drama enough in any book of musical history, but that same year, Berry Gordy’s Motown sounds hit the big time and Brian Wilson made it clear that the Beach Boys were considerably more than just a “surf band” from Hawthorne, California. Amidst such theatrics, popular folk groups like the Kingston Trio, the Brothers Four, and even Peter, Paul and Mary – big stars in 1962-63 — were faced with the unhappy prospect of sudden obsolescence. In hindsight, it’s amazing how abruptly the musical landscape changed. By the fall of the year, it had become clear that the public was getting bored with folk music. In fact, the group’s members themselves were interested in making a change — including Randy Sparks himself, who sold his interests in the venture to his business partners, Greif-Garris Management that September. In January 1965, the New Christy Minstrels embarked on their first European tour. The itinerary took them first to Copenhagen (Tivoli Gardens), then to London (the Palladium), and finally to Italy where they ended the tour with a climactic appearance at the San Remo Festival, winning top honors for their performances of “Se Piangi, Se Ridi” and “Le Colline Sono In Fiore,” both songs that were very much in the pop genre. In England, the group’s concert and TV appearances were booked by none other than Brian Epstein. It’s ironic that one of the key architects of the British Invasion that was deflating the career of the Christies back home would be responsible for a hugely successful appearance at the Palladium and a sizeable novelty hit on the UK charts – “Three Wheels on My Wagon.” Through their Epstein connection, the Christies attended Another Beatles Christmas Show at the Odeon Cinema in early January and enjoyed a backstage encounter with the “fab four” after the concert. Several of the members of the group — notably Barry McGuire — were floored by the new music. Both the performances and the intensity of the audience response were unlike anything they had seen before. Within a few days, Barry McGuire concluded it was time to quit the group. Beginning in the late Seventies through the Eighties, the group’s concert activity became more and more sporadic, eventually drying up altogether by the mid-Nineties. At the dawn of the new millennium, “The New Christy Minstrels” trademark had been dormant for several years. This created an opportunity for none other than Randy Sparks to reacquire the rights to a legally “abandoned” name. Since then, Randy has been performing with a stable cast of more seasoned performers as “The New Christy Minstrels Under the Direction of Randy Sparks.” The gray hair adds a touch of authenticity to a still upbeat repertoire. Randy is writing more material than ever – some of which he considers his best work ever. As of this writing, the group is busy in the studio recording two new albums. So, what happens next? Who knows? But, one thing is clear: We haven’t heard the end of the “New Christy Minstrels” saga yet.